The enCOMPASS platform, user apps and FUNERGY game released! welcome to the third newsletter of the European H2020 project enCOMPASS (Collaborative Recommendations and Adaptive Control for Personalized Energy Saving). As you read these lines, thanks to the hard work of the entire team we are successfully releasing the first version of the enCOMPASS platform and end-user applications for energy saving! 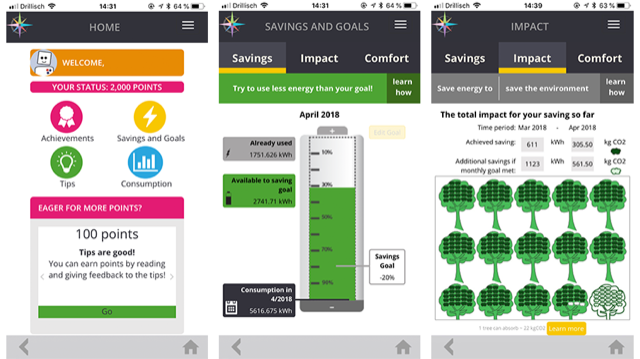 The results of the first user tests are promising and show that the enCOMPASS app can make energy saving easy to do while also being fun and considering users’ comfort. 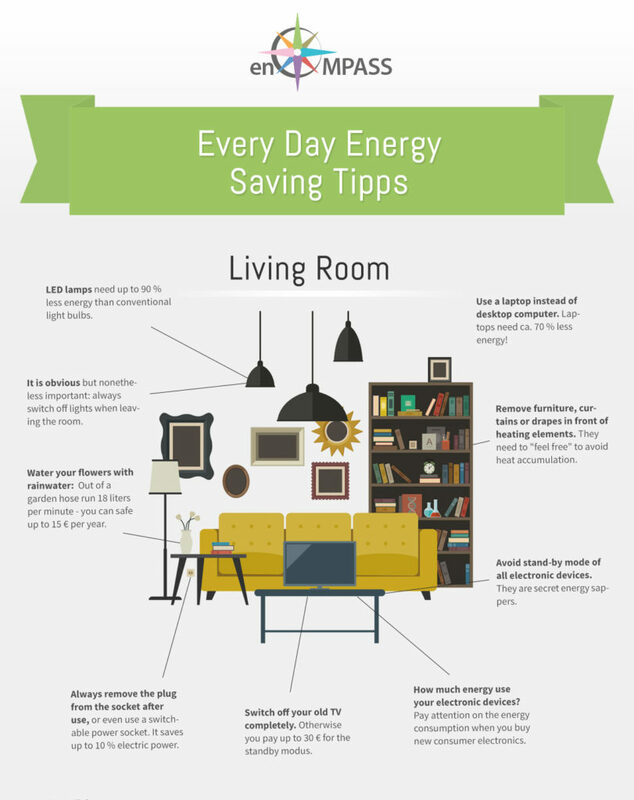 We’ve taken special care to develop intuitive visualizations of energy consumption that refer to easily understandable metaphors from everyday life and help users to understand the real-world impact of their consumption and to achieve personal energy saving goals. This platform release includes also a first version of a context-aware recommender service that delivers energy saving tips tailored to household profile and usage context, as well as smart home sensors and a comfort level inference engine that help users save energy while keeping their comfort. Our real-world pilots in Germany, Switzerland and Greece have also been successfully set-up with almost 300 participating households, 3 schools with around 900 students and 4 other public buildings, and we’re running into a beta test to be followed by the official start of the trial. In this issue, we share some insights into the setup and participating sites in the Swiss pilot. 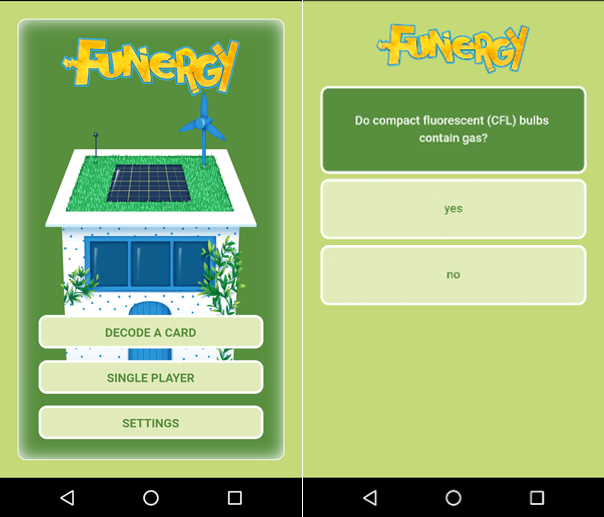 Finally, the first prototype of the FUNERGY game on saving energy combining a physical card game and a digital app has been completed and is ready to be distributed in the schools of the enCOMPASS pilots. Read on to find out more about it in this newsletter, and if you’re interested in trying it out in your school let us know – we’ll be happy to share! As always, we’ve been sharing our results and insights both through papers at scientific conferences, presentations at scientific, industry and citizen events and on our social media channels. Catch up with the latest news and publications on our website and follow us on Twitter and LinkedIn to keep in touch! Last but not least: if you’re attending ICWE2018 in Cáceres, BEHAVE 2018 in Zurich or the European Sustainability Week 2018 in Brussels on June 4-8, let’s catch up, we will be there. And if you’re a basketball fan, we’ve got special news for you: read on to find out how enCOMPASS is teaming up with the renowned Greek basketball team PAOK to promote energy saving! At the Swiss pilot site, all activities will take place in Contone, a fraction of the Municipality of Gambarogno. Overall, 614 smart meters were installed. Thanks to the enCOMPASS multisensors, additional information such as presence, luminance, temperature and humidity can be measured. The pilot is involving the local school and municipal building after meetings with both the building managers, directors and employees have taken place, to plan sensors installation and first information events. 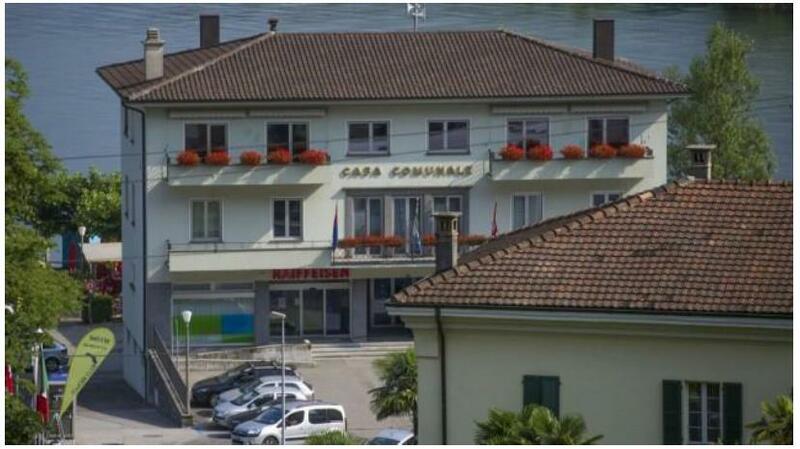 Furthermore, two requirements workshops have been held, respectively involving a group of employees in the municipal building and the director and teachers of the Cadepezzo primary school. Not only public facilities will be equipped with the enCOMPASS system. The involvement of household residents is done on a voluntary basis. The enCOMPASS system was introduced to the residents by flyers and a neighborhood assembly, attended by all types of population. 75 respondent households were selected as active participants to the enCOMPASS pilot, respecting the composition of households of the whole Contone area. Energy behavior (attitudes and perception) baseline data of all participants was taken by an online questionnaire. The selection of the control group households is currently under progress. All remaining households in Gambarogno (between 300 and 400 households) are contacted and their energy behavior requested. One project partner of the enCOMPASS family, the Greek electricity service provider WATT+VOLT, is sponsoring the successful Greek basketball team PAOK BC. Recently, the sponsorship was taken a step forward, creating the extremely ambitious and pioneering business project “PAOK ENERGY“. As part of this collaboration, the first WATT+VOLT store was created in the west of Thessaloniki. In the new store, which opened its gates mid of January 2018, visitors enjoy combined benefits through a wide range of products. 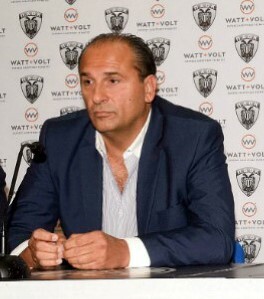 Privileges such as: reduced electricity prices and integrated energy services, with additional “surprises” and gifts (games tickets, signed jerseys by ex-superstar players and now president of the team Mr. Bane Prelevic etc.) of their favorite PAOK team. enCOMPASS excited and potential users can visit either the WATT+VOLT retail store or the PAOK ENERGY stores to subscribe for taking part in the enCOMPASS pilots in Thessaloniki, gaining a smart watt kit or join a game experience in PAOK Sports Arena, and of course all the enCOMPASS project benefits. For the enCOMPASS project, this is the perfect opportunity to gain further publicity and broaden their target groups. WATT+VOLT as an active enCOMPASS Partner is cooperating with PAOK BC to wide spread the Thessaloniki Pilot and the total project’s objectives. The team’s player houses and families were among the first ones who were pleased to join the enCOMPASS approach. 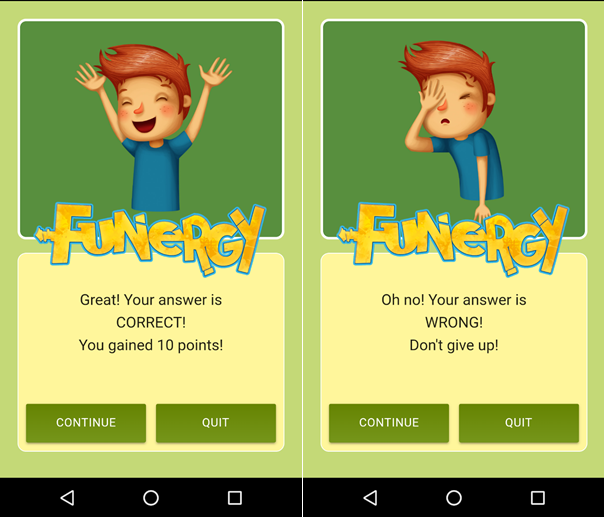 During the last project meeting in Brussels, POLIMI introduced a draft of the “Funergy” smartphone application that can be used with the card game. You can read more about the card game here in our last newsletter. The scan card button allows the users to scan the QR code of the physical card and answer the corresponding question. But the application can also be used alone. In single player mode the player can answer a set of questions related to energy. The application will work both online and offline, downloading new questions with internet access. The application and the questions are still in the making. Until now, the application supports only English and Italian and is available only for Android. In the future, the app will be available in five languages (English, Italian, German, French, Greek/Spanish) and also for iOS. A scoring competition function will be implemented soon. The users can compete against each other on a leaderboard. European Sustainability Week 2018 in Brussels in June, from 4th to 8th. ICWE 2018 in Cáceres in June, from 5th to 8th. SWEEM 2018 in Stanford CA, USA in June, 25th. BEHAVE 2018 in Zurich in September, from 5th to 7th. Die enCOMPASS Plattform, Benutzer App und FUNERGY Spiel veröffentlicht! willkommen zum dritten Newsletter des EU-H2020-Projekts enCOMPASS (Collaborative Recommendations and Adaptive Control for Personalized Energy Saving). Während Sie den Newsletter lesen, veröffentlichen wir – dank harter Arbeit des gesamten Teams – die erste Version der enCOMPASS Plattform und die Endnutzer-Applikation zum Energiesparen! Die Ergebnisse des ersten Nutzertests können sich sehen lassen! Die Tests zeigen, dass die enCOMPASS-App Energiesparen einfacher macht und dennoch Spaß machen und komfortabel sein kann. Mit besonderer Sorgfalt haben wir die intuitive Visualisierung des Energieverbrauchs entwickelt. Dabei werden verständliche Metaphern aus dem Alltagsleben mit einbezogen und den Nutzern so die Auswirkungen ihres Verbrauchs in der realen Welt nachvollziehbar erläutert. Das soll dazu beitragen, das persönliche Energiesparziel der Nutzer bestmöglich zu erreichen oder gar zu übertreffen. Die veröffentlichte Plattform beinhaltet auch eine erste Version der umgebungsbezogenen Empfehlungsdienste, die den Haushalten maßgeschneiderte Energiespartipps im Nutzungskontext liefern sollen. Außerdem sind Smart-Home-Sensoren und eine Komfortzone-Störungsfunktion integriert, die den Nutzern helfen, Energie zu sparen und gleichzeitig ihren Komfort zu bewahren. Unsere Pilotprojekte in Deutschland, der Schweiz und in Griechenland wurden erfolgreich eingerichtet. Nun nehmen fast 300 Haushalte, 3 Schulen mit rund 900 Schülern und 4 weitere öffentliche Einrichtungen an dem Projekt teil. Derzeit läuft der Beta-Test, gefolgt vom offiziellen Start der Pilotprojekte. In dieser Ausgabe teilen wir einige Einblicke über die Ausgangslage und zu den Teilnehmern des Schweizer Pilotprojektes. Endlich steht der erste Prototyp des FUNERGY Lernspiels! rund ums Thema Energie. In einer Kombination von Brettspiel und digitaler App können die Anwender spielerisch Energie sparen lernen. Die ersten Spiele werden nun an den Schulen der enCOMPASS Pilot-Regionen verteilt. Lesen Sie mehr dazu weiter unten im Newsletter. Sollten Sie selbst interessiert sein, das Spiel an Ihrer Schule auszuprobieren, dann kontaktieren Sie uns einfach – wir freuen uns darüber, das Spiel mit Ihnen zu teilen! Wir teilen auch weiterhin unsere Ergebnisse und Einblicke durch Publikationen auf wissenschaftlichen Konferenzen, Präsentationen auf wissenschaftlichen, Industrie- und Bürgerevents sowie auf unseren Social-Media-Kanälen. Bleiben Sie auf dem Laufenden mit den jüngsten News und Publikationen auf unserer website und folgen Sie uns auf Twitter und LinkedIn! Zu guter Letzt: Falls Sie an der ICWE2018 in Cáceres, an der BEHAVE 2018 in Zürich, oder an der European Sustainability Week 2018 in Brüssel vom 4. Bis 8. Juni teilnehmen, dann besuchen Sie uns doch gerne an unserem Stand. Wir freuen auf Sie! Und für unsere Basketballfans haben wir ganz besondere Neuigkeiten: im Newsletter erfahren Sie, wie sich enCOMPASS mit dem renommierten Griechischen Basketballteam PAOK BC zusammentut, um auch allen Sportbegeisterten das Energiesparen näher zu bringen! Das Schweizer Pilotprojekt findet in Contone, einer Region der Gambarogno Gemeinde, statt. Insgesamt wurden 614 intelligente Stromzähler, so genannte “Smart-Meter”, installiert. Dank der enCOMPASS Multisensoren können zusätzliche Informationen wie Anwesenheit, Helligkeit, Temperatur und Feuchtigkeit gemessen werden. 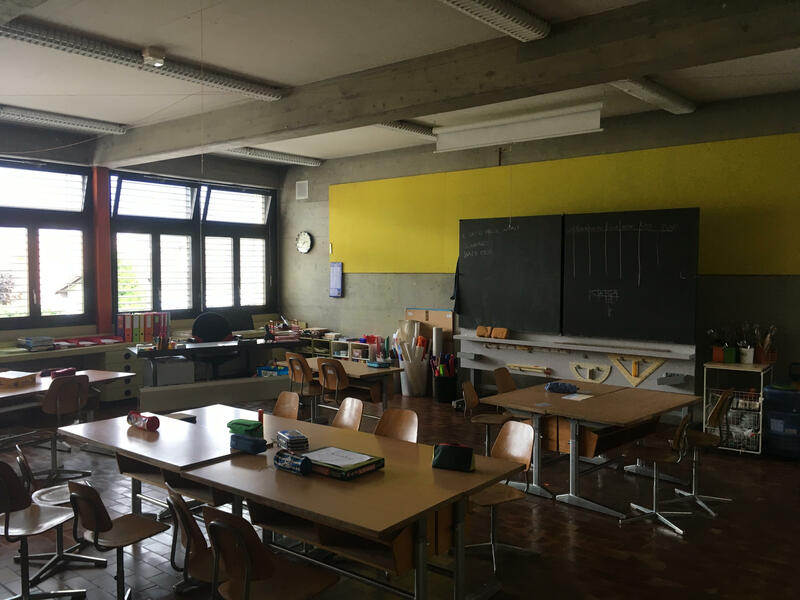 Das Schweizer Pilotprojekt umfasst die lokale Schule und das Gemeindezentrum. Nach Absprache mit Gebäudemanagern, Direktoren und Mitarbeitern wurden die Sensor-Installationen geplant und Informationsevents durchgeführt. In diesem Rahmen wurden auch zwei Workshops zu den Anforderungen an Mensch und Technik abgehalten, an denen sich jeweils die Gemeindemitarbeiter, der Direktor und die Lehrer der Cadepezzo Grundschule beteiligt haben. Es wurden nicht nur öffentliche Einrichtungen mit dem enCOMPASS-System ausgestattet. Auch Haushalte konnten sich auf freiwilliger Basis am Projekt beteiligen. Das enCOMPASS-System wurde den Einwohnern der Region mit Flyern und im Rahmen einer Nachbarschaftsversammlung vorgestellt. Von einer Vielzahl an Rückmeldungen wurden letztlich 75 Haushalte als aktive Teilnehmer des enCOMPASS-Pilotprojekts ausgewählt. Dabei wurde auf eine repräsentative Mischung aller Bewohner der Contone-Region geachtet. Das Verhalten zu Energie und Energieverbrauch (Einstellung und Wahrnehmung) der Ausgangsdaten aller Teilnehmer wurde mittels eines Online-Fragebogens erhoben. Für die wissenschaftliche Untersuchung der Projektergebnisse werden derzeit Haushalte ohne “Smart-Meter” als Kontrollgruppe ausgewählt. Darüber hinaus wurden die übrigen Haushalte in Gambarogno (zwischen 300-400 Haushalte) wurden kontaktiert und zu ihrem Energieverhalten befragt. Einer der Projektpartner der enCOMPASS-Familie, der Griechische Stromversorger WATT+VOLT, unterstützt das erfolgreiche Griechische Basketballteam PAOK BC. Kürzlich wurde das Sponsoring einen Schritt weitergeführt, indem das extrem ambitionierte und bahnbrechende Projekt “PAOK ENERGY“gestartet wurde. Teil der Zusammenarbeit ist die Eröffnung des ersten WATT+VOLT Stores im Westen der griechischen Stadt Thessaloniki. In dem neuen Store, der erst diesen Januar eröffnet wurde, genießen Besucher kombinierte Vorteile durch eine breite Palette an Produkten. Kunden erhalten privilegierte Produkte wie z. B. günstigere Strompreise und integrierte Energiedienstleistungen, zusätzliche “Überraschungen” und Geschenke (Eintrittskarten, unterschriebene Trikots der Ex-Basketball-Stars, der aktuellen Spieler und des jetzigen Präsidenten des Teams Bane Prelevic etc.). enCOMPASS-begeisterte und potenzielle Nutzer können entweder den WATT+VOLT oder den PAOK ENERGY Store besuchen, um ihre Teilnahme am enCOMPASS Pilotprojekt in Thessaloniki zu starten. Dabei können sie ein Smart-Meter-Set, den Besuch in der PAOK-Sports-Arena, und natürlich auch all die anderen Vorteile des enCOMPASS Projekts erhalten. Das ist eine großartige Möglichkeit für enCOMPASS, seine Bekanntheit zu steigern. WATT+VOLT als aktiver enCOMPASS-Projektpartner erreicht durch seine Kooperation mit PAOK BC große Bekanntheit für das Unternehmen und das EU-Projekt in Thessaloniki. Die Häuser und Familien der PAOK BC-Spieler gehören selbstverständlich zu den enCOMPASS-Teilnehmern und Unterstützern des Energieeinspar-Konzepts. Während des letzten Projektmeetings in Brüssel wurde durch den Projektpartner POLIMI ein erster Entwurf der Funergy-Smartphone-App vorgestellt, die gemeinsam mit dem Brettspiel verwendet werden kann. Mehr zum Brettspiel gibt es hier im letzten Newsletter. Mit der App kann man den QR Code auf der physischen Karte scannen und die dazugehörige Frage beantworten. Die App funktioniert aber auch ohne das Brettspiel. Im Einzelspieler-Modus kann der Spieler eine Reihe von Fragen rund um das Thema Energie beantworten. Dabei funktioniert die App sowohl offline als auch online, wobei der Internetzugang den Zugriff auf aktualisierte Fragen ermöglicht. Sowohl die App als auch die Fragen werden derzeit noch weiterentwickelt. Die Spiele-App gibt es bislang in zwei Sprachen, Englisch und Italienisch, und sie ist bislang nur für Android verfügbar. Künftig wird die Spiele-App in fünf Sprachen (Englisch, Italienisch, Deutsch, Französisch & Griechisch/Spanisch) und auch für iOS verfügbar sein. Demnächst wird der App auch eine Wettbewerbsfunktion hinzugefügt, in der die Mitspieler Punkte sammeln und gegeneinander antreten können. Die Mitspieler können ihr Punktekonto dann auf einer Bestenliste betrachten.